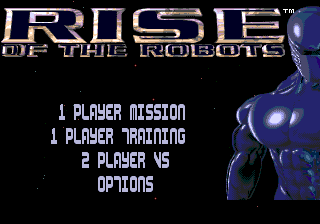 Rise of the Robots is a fighting game originally developed by Mirage Technologies for the Amiga and DOS-based computers and published by Time Warner Interactive in 1994, which was later ported to the Sega Mega Drive and Sega Game Gear, amongst other systems. The Mega Drive version was only released in Europe, where it was published Acclaim Entertainment. Rise of the Robots sees the player controlling a robot called "Cyborg" fighting a series of computer controlled opponents (which can be controlled by player two in versus mode, but never player one). It is a very simple fighting game, in which one button punches and another kicks (with the Mega Drive six-button layout, this defaults to and punching, while and kick). According to Mirage, unlike many earlier games, the computer players in Rise of the Robots will keep track of the human player's actions, and will become more successful at countering or dodging moves that are performed more than once. Gameplay is also adjusted depending on how often the player hits an opponent, blocks, or fails to make contact at all. The vast majority of graphics in Rise of the Robots were produced in 3D Studio, with many of the robots opting for "unusual" fighting stances specifically to highlight the then-cutting edge visuals. Each robot has around 100 frames of animation in total, though the computer imagery meant that many of these are interpolated between defined keyframes. Rise of the Robots was initially built with Amiga computers in mind, with higher resolution assets being used for an IBM PC compatible version, released around the same time. All console ports stem from these two versions of the game. A side effect of its home computing roots is that Rise of the Robots targeted joysticks with only one button, leading to a drastically reduced moveset compared to contemporary fighting games of its day. Though the game emphasised the inclusion of a soundtrack by former Queen guitarist Brian May, only one song of his made it to the final release: The Dark, used as the title theme, though some versions also include the song Resurrection for cutscenes. Both songs were released as part of May's 1992 solo album Back to the Light. The rest of the game's music was composed by Richard Joseph. In Europe, Acclaim Entertainment purchased the publishing rights Rise of the Robots, originally planning to launch the game simltaneously across all platforms. This plan changed, however, with the Nintendo versions appearing for Christmas 1994, and Sega versions arriving in early 1995. A Sega Mega-CD port was planned to be released by JVC in the US (once dated for January 1995), but was cancelled for unknown reasons. A promotional video advertising the the version was distributed, featuring "work in progress" footage from the game (although said footage originated from the DOS version) and a VRC rating of GA. Interestingly the Mega Drive version's credits note that Antonio Argentieri programmed both the Mega Drive and Mega-CD ports. Despite spending significant sums of money in developing and marketing the game, Rise of the Robots was met with poor reviews. Time Warner Interactive had planned for a range of merchandise including action figures, but as word spread of the game's poor performance, all of these plans were shelved. Nevertheless, Rise of the Robots was followed by Rise 2 Resurrection in 1996, however this too failed to meet expectations. Main article: Rise of the Robots/Magazine articles.